This is an unapologetically sweet recipe. Having said that, I cringed a little when I wrote down the quantity of sugar required, and so I suppose it is a slightly apologetically sweet recipe. Regardless of apologies, though, this is an excellent recipe to have up your sleeve. Baked for a little less time, dusted with icing sugar and served with some good quality vanilla ice cream and berries and you have a perfectly guest-appropriate, totally delicious, albeit relatively unsophisticated dessert. 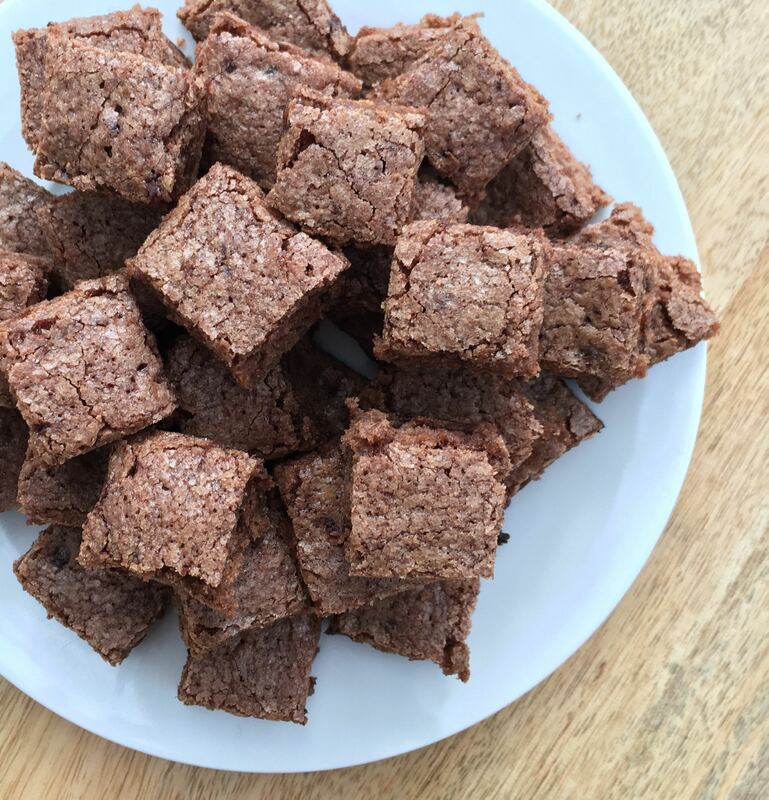 Baked a little longer until firm (as below), cut into micro squares and you have a guaranteed hit at a bake sale / colleague’s leaving do / lunchbox Friday treat – you get the drift. And, conveniently, they are the perfect pep-up when solo parenting 4 small children, while your husband is in a penthouse suite, enjoying 28degree sunshine. What I’m trying to say is: everybody loves a chocolate brownie! I will add that I have tried a number of recipes that are more complex than this; that use a million eggs (I’m looking at you, Nigella); that rely on a more sophisticated melted chocolate rather than the half-cup of cocoa powder that this recipe calls for. Those recipes, though, are much more complex and yield something far less satisfying than this, which has exactly the sweetness and density you want from a brownie. Enough of the intro! Here’s the recipe. Line a baking tray, a regular rectangular brownie sized tray. Melt the butter. Add all the other ingredients in the order described. Mix. Bake for 20minutes (gooey centred) – 28minutes (firmer, lunchbox appropriate). Cool on a rack. Slice. Eat, with a cup of tea and the soothing sounds of the Octonauts in the background while you obsessively refresh screen on your husband’s return flight details. Nearly there. These sound yummy! Do the following amounts look right for the ridiculously backward Americans who won’t join the world in using the metric system?